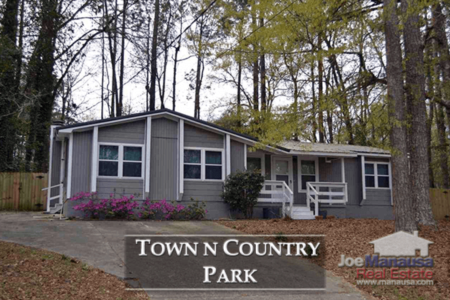 Town N Country Park is a sixty year old subdivision with single family homes that are mostly 3 and 4 bedrooms. If you are looking for great location (whether as a place to live or a place to invest), then I think you will be excited with what you find in this centrally located neighborhood. It is technically in the Northwest quadrant of Tallahassee, though most residents think of it as very near midtown. It's roughly one mile away from The CENTRE of Tallahassee (formerly known as the Tallahassee Mall), so you should expect excellent appreciation in the next ten years for these homes. When The CENTRE of Tallahassee is fully up and running, Town N County will likely be a hot-spot for younger people who want to be located near where it is all happening. 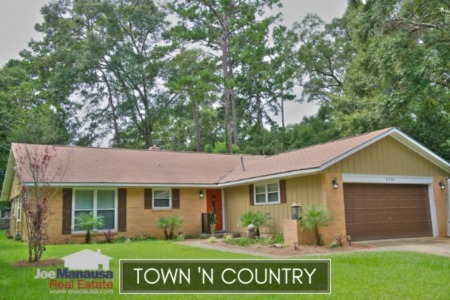 So take a look at home prices, home values, and home sizes, along with all current listings in the Tallahassee MLS and all closed home sales going back to 1991 to see what you think about Town N Country Park. It is important to note that the narrative contained below is for sales through December for all previous years, but through the fourth week of September in 2015. The graphs and the closed sales table will be continuously updated into the future (meaning bookmark this page if you always want to know the current status of homes in Town N Country Park). Average home prices are down 13% when compared to 2014, mostly due to very small homes that made it into this year's line up. The average recorded sales price is $113,800 for Town N Country Park thus far in 2015, which means recent buyers have practically stolen their homes. They will look back in 10 years and be extremely proud. Home sales activity in 2015 is consistent with the past four years. Through the fourth week in September, there have been 11 closed home sales in Town N Country Park. Average home values in Town N Country Park have held steady this year after having declined in 2014. Distressed home sales continue to impact valuations, but their numbers are thinning and will likely have far less of an impact in the future. Both investors and occupying buyers would be prudent to recognize that single family homes on more than a quarter of an acre within walking distance to shopping and schools will return to high demand in the near future. Builders can no longer supply homes like this to the market at prices below $300,000, yet you can get one in Town N Country Park today for less than half the going rate for new construction. Through the fourth week in September, the average value of a home sold in Town N Country Park this year has been $77 per square foot. The average home size sold in Town N Country Park typically falls in a range of 1,500 to 1,700 square feet, and 2015 has recorded sales at the lowest end of this range. The 11 home sales in 2015 have averaged just 1,531 square feet. The following list of homes are the most recent listings in Town N Country Park. The following list shows home sales going back to 1991 in Town N Country Park. I hope you enjoyed our September 2015 update on home sales in Town N Country Park, please feel free to drop me a note if you have questions not covered in this report.